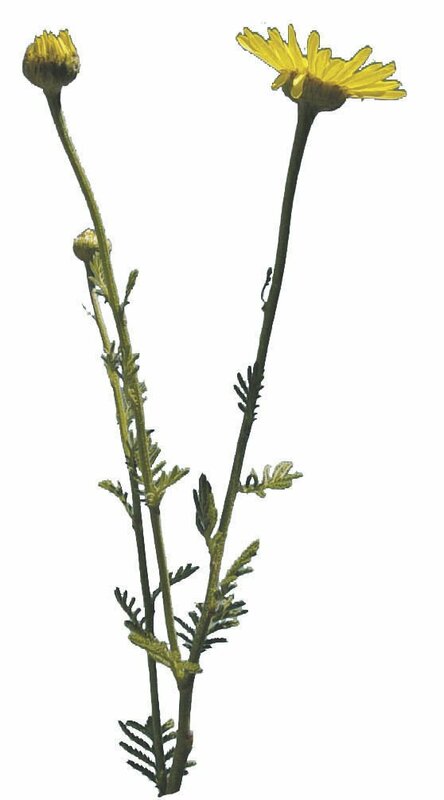 Strategy: This biennial, short-lived plant is also known as yellow chamomile and comes to us from western Asia, originally used as a dye from its brilliant golden yellow flowers and as a tea. It is nonaromatic as compared to its close relative, mayweed chamomile. It has yellow ray of flowers in the center with yellow petals around the outer edges of the flower. These flowers occur on the terminal end of the plant. Plants generally grow to 24 inches tall and produce multiple stems from a single taproot. Leaves are pinnately dissected, almost feathery and occur on the entire plant. Attack: Like many plants, this is more or less an escaped ornamental. Once established, it continues to spread as livestock will usually leave it alone and overgraze desirable forage. Although used as a medicinal tea, it also thins blood and has other side effects. It is very competitive. Problems can occur along roadsides, disturbed noncrop sites and invade range and pasture settings. Defense: Don’t let ornamentals become your next problem. In most cases, if you didn’t plant it and you don’t know what it is, pull it up and take it to a friend or send a picture to a knowledgeable person. Better yet, take it to your county weed office for proper identification. As this is a biennial, pulling it with most of its roots will kill it. Once established in range, pasture or noncrop sites, herbicides such as Milestone, Opensight or Telar XP are excellent materials most times of the season. None of these products have grazing restrictions (unless for milking animals); you just need to manage the manure.